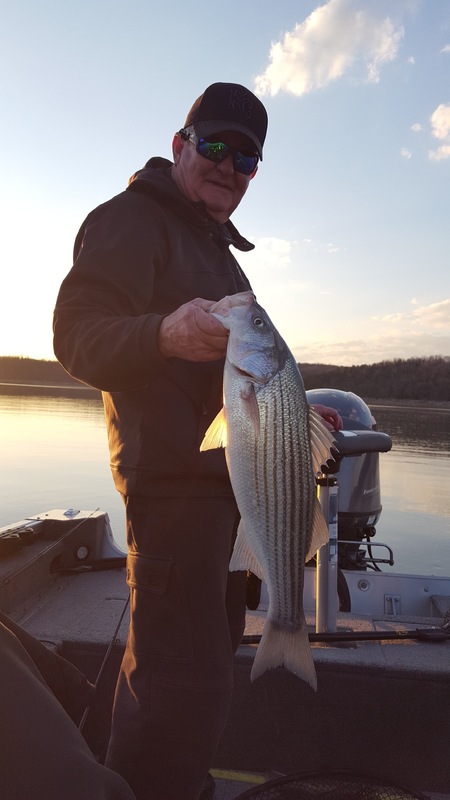 Spring has sprung on Norfork Lake. The weather has been absolutely gorgeous the last several days. 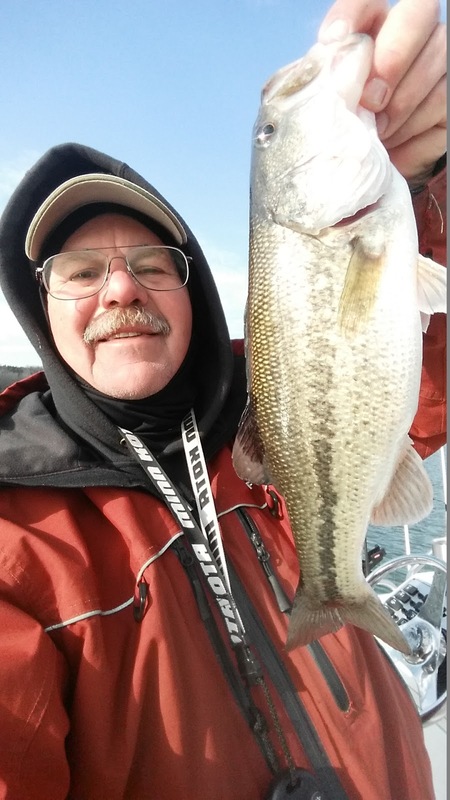 The lake water temperature is on the rise and fish activity is increasing daily. It has been exciting to see the fish transition from the winter pattern to the early spring pattern. 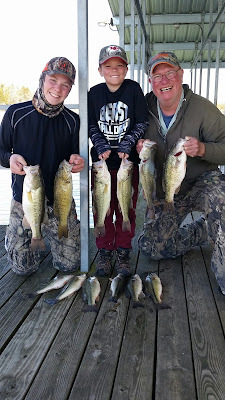 Bass fishing has been awesome with largemouth and spots being the most abundant with an occasional smallmouth mixed in. 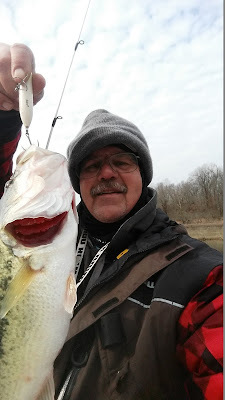 Crank baits and jerk baits are working very well. This morning I got into an hours worth of great top water action using a Zara Spook. The fun has begun for the early spring bite. I found top water action part way back in a small creek on a shallow round point where the channel swings in. The fish were in 5 to 20 feet of water and chasing shad in a very large area. I landed a fish on about every other cast. The majority of the fish were short, but in an hour I landed 6 keepers with the largest well over 3 pounds. Yesterday, I was part way back in a major creek in a similar type of area, and found a lot of bass in 10 - 18 feet of water. My jointed tail, flicker shad, size 7 was working great. The fish were closer to the bottom with very little top water in this location. The other type of area producing fish is shallow main lake points, especially if the channel swings in close to the point. Same types of baits mentioned earlier are working in these areas as well. 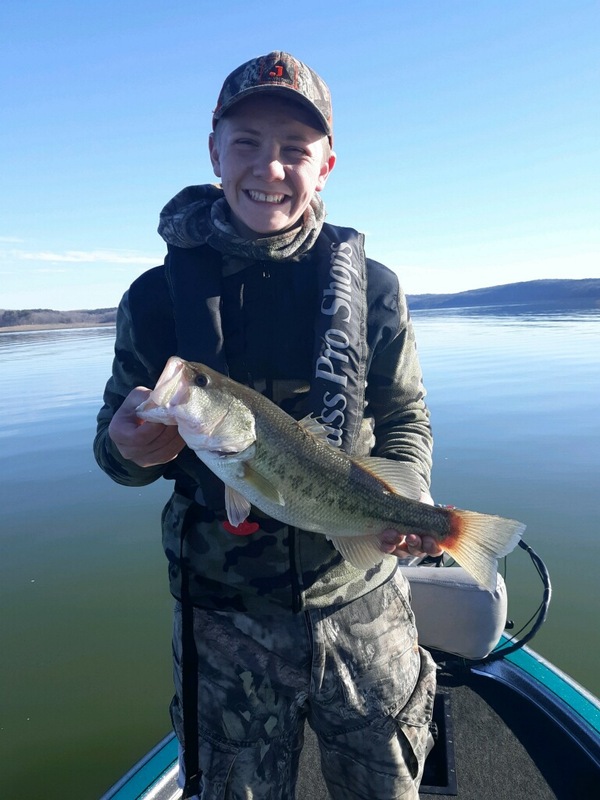 As the water level becomes more stable, more and more of the bass will move back into the creeks and will start staging for their spawn. That also means they really start to feed heavily. 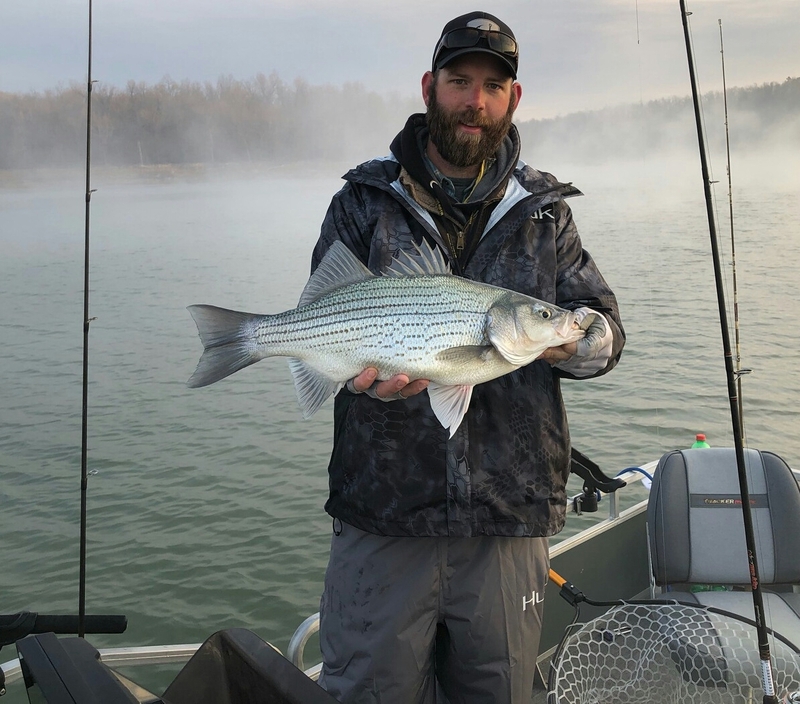 The striped bass bite is also transitioning from its winter pattern to its early spring pattern. What this means is that the fish are moving out of the deeper water and are moving in close to the shoreline to feed. The striped bass move to the shallow water to feed, has just started over the last several days. They are following the bait fish to their new feeding grounds. This is also changing my fishing times. Over the last several days the best bite for striped bass has been about an hour before and after sunrise and similar times at sunset. This is also telling me that the stripers should be feeding after dark so, if you like throwing a suspending jerk bait, now is the time to be out there. I myself have not been out after dark yet, but I will be soon. I have two different baits that I enjoy using this time of year. The one I use the most is a 6 inch swimbait with a paddle tail. I use a 3/8 oz to 1/2 oz jig head. I cast it toward the shoreline and let it sink to the bottom, then use a steady retrieval back to the boat. The other bait I like is a suspending jerk bait. My retrieval method varies until I find out what the fish wants. I may retrieve it like a crank bait or work it as a jerk bait. I guess I have one more favorite bait in my arsenal, my trusty 1/4 - 1/2 oz. Kastmaster. I typically change hooks out to one size bigger and add a feather trailer. 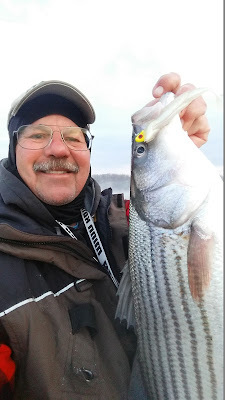 This morning I landed 2 stripers in about 6 feet of water on a swimbait, along with a handful of large white bass. There was a few bigger fish hitting the surface, but very sporadically. 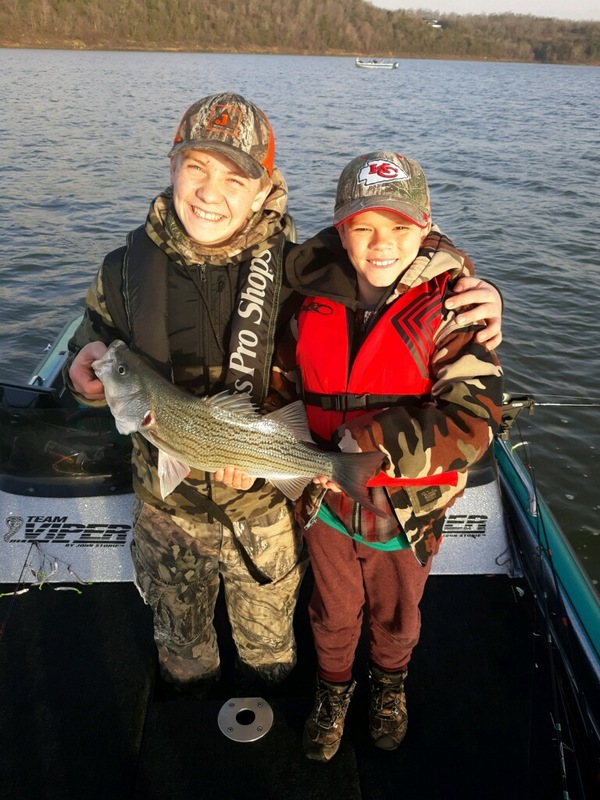 The top water for striped bass will pick up over the next several weeks if the weather continues its warming trend. The best areas that I have found for stripers are main lake points that are very shallow on one side and deep on the other. Crappie fishing has been fair. 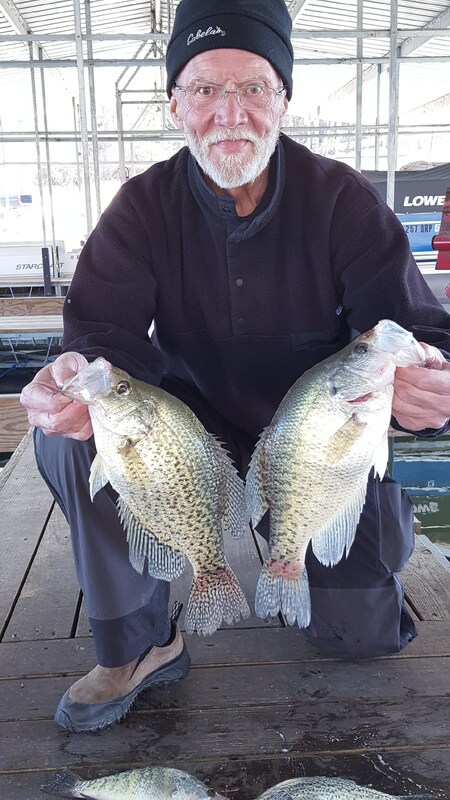 My crappie fishing guests are catching quite a few crappie, but the bigger ones over 11 inches long are harder to come by. 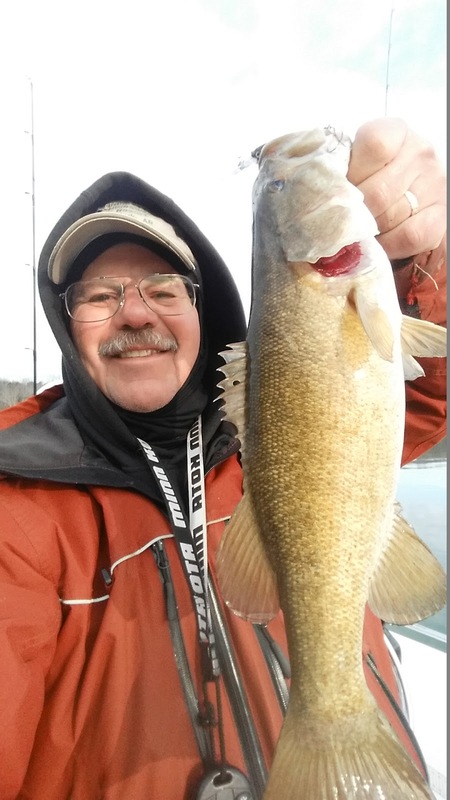 They have been landing around 8 to 12 nice fish a day, along with many short ones. Small 1/4 spoons in white and green or white and chartreuse have been working for them. Live crappie minnows are always a great bait for crappie fishing. The fish are on brush at all different depths. You can find fish on brush from 20 feet to 35 feet deep. Crappie will be buried inside of the brush or suspended above the brush. You will need to keep fishing different depths until you start catching fish. 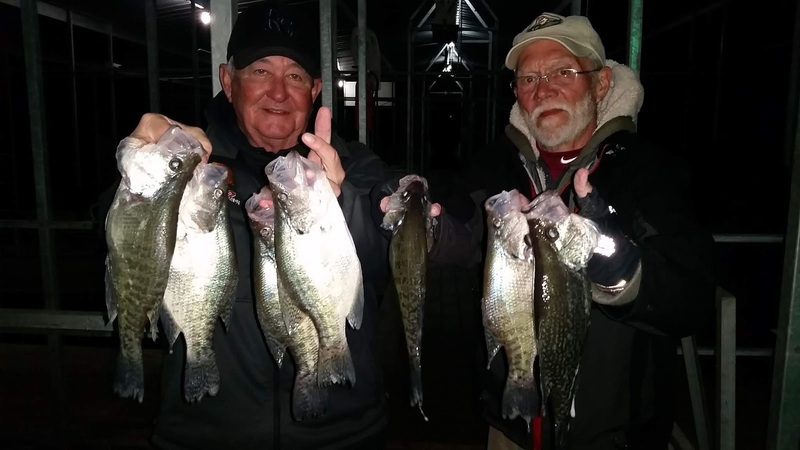 Lately the crappie have seemed a little more timid, so you may have to move often to catch your fish. Norfork Lake level is currently falling about 3 inches per day with both generators at the dam running. The lake currently sits at 555.29 MSL. This equates to only 1.5 feet above normal seasonal pool. The lake surface water temperature this morning was 52 degrees. It warms during the warm day and then cools again during the cooler evenings. The lake is mostly clear with maybe a 5 - 6 foot visibility. Some creeks are similar to the main lake clarity and other are stained a greenish tint. Overall the lake is in great shape and the fishing is shaping up to be a fun spring bite.